So, your nearly-new Maytag Neptune washer is tripping the GFI outlet for no apparent reason. If you’re sure the GFI outlet itself isn’t at fault, then the problem may be moisture running down the wire harness and into the motor harness connector. This can cause corrosion of the terminals, premature motor failure and, by the way, trip the GFI. 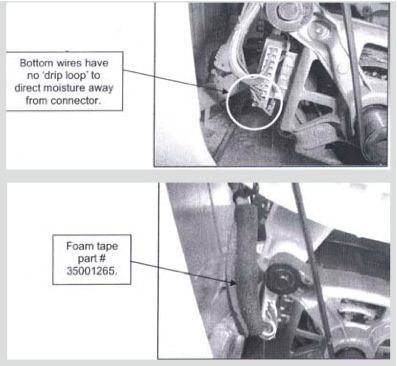 If the wire harness and terminals in the motor connector are still in good shape, Maytag recommends wrapping the wire harness with special foam tape to keep water out of the harness. The better fix is to replace the entire wire harness because it includes a drip loop for additional protection. This entry was posted in Washer Repair on January 10, 2007 by Samurai Appliance Repair Man.